My breath paused when I came across this interview of James Dillet Freeman last February (2013). Not because it was an unknown interview that had been stashed away in Unity's Archives for thirty-one years. My breath paused because this was an interview by Tim Cook, once the leader of Unity's fastest growing church and co-founder with wife Barbara of Austin's Church of Conscious Harmony, which just may be Austin's best-kept secret for anyone on a spiritual journey. 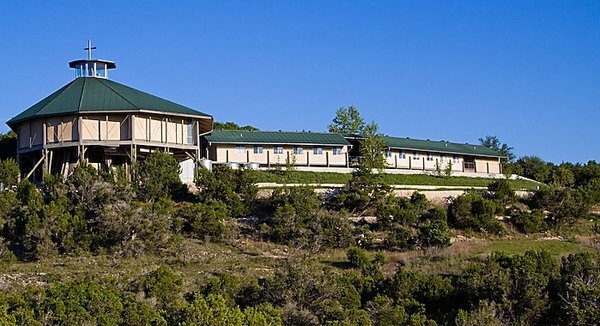 Nestled in the rolling, west hills of Austin, CCH is the place many Unity truth students go to find authenticity and quiet. It's a self-declared church. And it's unabashedly Christian. The style is contemplative, as is its teaching. In short, Tim and Barbara Cook are not ashamed of the Gospel. Many denominational leaders are saying that Americans today have an allergy to anything "Christian." But no one is sneezing at CCH. On a visit to CCH a few years ago I sat next to Karen, who had been our pianist in Georgetown. Karen's modern. She loves the Beatles. She has the sharp mind of a critical thinker. She's the last person you would expect to find in a church so steeped in western, spiritual tradition. But that Sunday, through most of the service, she wept. I learned that day how deeply the so-called cultural creatives hunger for authenticity. And when Truth comes in an authentic way, they respond. The last time I visited was Palm Sunday. Something in me knew that Tim Cook would deliver a message on the passion of Jesus that I needed to hear. I was not disappointed. You see, about half-way through the sermon Tim reached into the bag of books he always carries and pulled out his copy of Keep a True Lent. After quoting Charles Fillmore and making his point, he continued on. On my way out after the service, I swung by the bookstore. Daily Word was prominently placed next to the cash register. To the right was a rack of Unity books. The Sunday bulletin announced that Lessons In Truth, one requirement for membership, was taught on Wednesday nights. Unity's early days are a foundation. Character of leadership is more important than new fads. Spiritual practice is central. Don't be a guru and don't deify the minister. Teach from the Bible. Go with Christian fundamentals. Be cautious of the spiritual potpourri. Know Jesus Christ as a living reality. Q. Jim, I thought I'd begin by asking how you originally became involved in Unity. A. Well, it was in a very different way. I was a small boy and my family broke up in a very unpleasant way. My mother ran off and brought me and one sister with her so we had a stepfather. He was a real food faddist, way out, went on long fasts just living on fruit for a week even though he did very hard work. He was a pressman, a powerful man. So when he went on his vegetarian diet all of us did because what he went on we all went on. He heard about the vegetarian inn at 9th and Tracy. My stepfather was as extroverted a man as I have ever known. After he went to the Inn once he probably knew everybody there. When he went twice he knew everybody in Unity and we started going to Sunday School. That's how I started. Q. How did Unity become your vocation? A. Well, Charles and Myrtle Fillmore always had a healing meeting on Wednesday and they liked entertainment but they didn't like to pay much for it so sometimes they wouldn't get a musician and they would occassionally ask me to read my poetry. Then, when I was still going to school, Myrtle got me a job in Silent Unity addressing envelopes. I worked in Silent Unity and then when I finished school Cora, whom I knew just as well as I knew Myrtle came and asked me to go to work in Silent Unity again, rather she told me to go talk to Charles Fillmore, and at the time I had no intention of going to Unity or any other religious organization, but there were no jobs at the bottom of the depression, so I took the job and came to Silent Unity and have been there ever since. That was a long time ago. When I first came to work at Silent Unity it was 1929. Only one person has worked here as long as I have, longer as a matter of fact, and that's Billie. Q. I'm very interested in the feeling of Unity in its early days. What kind of orientation did it have toward becoming a movement? I'd like to get a feel for the evolution of Unity's mind about itself. A. It was a movement. It was every bit as much a movement as it is today. And it was a nationwide and worldwide movement already. We didn't have too many centers although we had them from almost the beginning of Unity, clear back in the 90's, but they didn't grow. We did have a tremendous number who wrote to us at Silent Unity, a tremendous number. Our most popular magazine then was Unity. I think it had peaked and started to decline with the depression. The depression cost us many followers. People couldn't afford it. They couldn't afford the dollar. But I think Unity had about a quarter of a million subscribers in the late 20's. Hundreds of thousands wrote to Silent Unity. Q. Was there a wave of New Thought going through the country at the time or was all the interest caused by Fillmore's personal charisma? A. Well, it wasn't Fillmore's personal charisma because nobody knew him. We were strictly a written word religion, not a personal religion. We were not churches. Actually the church didn't have too many members. Probably not as many as it did later with Ernest (Ernest C Wilson), as far as the church was concerned. But we reached people through the written word. This was a religion of the written word and so far it still is. After all, the spoken word, centers and such are a relatively small part of our work. We reach millions through the written word. How long it will be this way, I don't know. It is going to be years and years before there are that many centers that they will outbalance in importance the written word. We have always attracted people through Silent Unity and through our publications. That was the original intent of the movement. Q. I get the impression that there was some soul-searching about the establishment of centers and ministers and that they were an addendum to the original intent. A. I have said that myself, but I don't think it is particularly true. I think there were always centers. After all Charles Fillmore founded one. That was what he was. He had a church. He tried to do it in non-church terms, but it didn't work. He tried having the meetings on Sunday afternoon and using different formats but none of those worked too well and he fell back on having his 11 o'clock church. He was ordained by Emma Curtis Hopkins, but then he was ordained again by Unity; by himself in a sense. He ordained other Unity people at that time, back in the early 1900's. But the emphasis has always been on the written word. Q. Was there a change of direction or focus or a loss of energy in the Unity movement when Charles Fillmore passed? A. I don't think so for a very good reason. He was 90 years old when he passed. How active a part is a 90 some year old man going to take in a movement? For years his part in the movement had not been too much. You know, if he had passed at 50, it could have been disasterous because of the fact that he would have been a bundle of energy at the time. But in his later years after he had started going out and speaking around the country, his interest in Unity School obviously diminished a great deal. He gave his time to his talks, teaching a class, that kind of thing. He married Cora and that changed it too. Q. Was there any tendency to deify him or to give him grander powers than he would have wanted? A. Sure, it was natural. People always do that. How can they help it. He founded the place and he was here all those years . You know, if you live to be 94 years old you are going to get a certain amount of veneration. Even if you don't do anything, you tend to, or you did. 94 year olds are a little more common now. But of course they venerated him. However, Charles Fillmore, as long as I knew him, didn't act in any way different. He was a very ordinary man as far as his tastes and his interests were concerned. He just liked the things that everybody else liked - apple pie, corn on the cob and western movies. Those were his favorites, he couldn't stand being away from western movies. Q. Do you know any thing about his personal spiritual practices? A. Yes, he prayed for long hours everyday, meditated for long periods and often it was very easy for him to enter into a meditation and just sit there. Everybody would think that he was asleep. I don't know, maybe he was, but I always assumed he was meditating. It was very easy for him to do that and I am certain that he spent hours everyday being quiet, turning within. Far more hours than most of us. Q. I get the impression that he didn't view the world through the same eyes that most of us do - that he didn't see a solidity in it. It's hard to see apple pie and western movies in the man who writes about smashing atoms with the mind. A. No, Charles was a very human human. He was not a guru sitting and gazing at his own naval in sandals and a robe. No way. He liked life. He was a common sense intelligent human human being. A very human sort of human being. He liked jokes, he loved them. He loved to tell them. I don't imagine the man ever made a speech in his life without a joke in it and he loved to hear them. Q. How much of the character of the movement today is a reflection of his character? A. We can go off into space and space right out, but we are not spaced out due largely to the fact that Charles wasn't. Now it wasn't because he didn't have a lot of such interests, but he never let them wreck his life or wreck the movement. No, Charles was interested in all sorts of psychic things and the like, but he never let them dominate his life. The things that he really enjoyed were ordinary things - watermelon. Q. The grounding that he gave us for the movement today seems so securely rooted in the Bible and so deeply rooted in a real fundamental Christian understanding of the universe that it amazes me that we are so free to let other teachings and new ideas come in. What do you attribute that to, Jim? A. Yes, he wasn't a Christian for a long time. Charles didn't come at this through Christianity even though he was brought up in an Episcopalian house. Myrtle was a Methodist, far more devout than he was. I don't think Charles was ever devout and I doubt if his mother was ever that devout. The Episcopal religion is a rationalized religion and probably was to a great extent even then in the 1880's and he was an Episcopalian and he became interested in all sorts of thing, All you have to do is look at the first issue of Modern Thought where you have things about Buddaism and everything else in there. I have always assumed, I don't know this because nobody else does, that we became so strongly Christian because of Myrtle who was such a Christian. She was raised in a devout Methodist family and she was anti everything that Christians are supposed to be anti. Narrow - all the narrow puritan notions were Myrtle's. Charles I am certain didn't have them. Charles was a part of the wild west. He was a pioneer and he went off as a kid into Texas and Colorado when there was nothing there except some pretty wild settlements and that is where he grew up. But Myrtle civilized him I am sure - and his own good sense. I think he realized that if we were going to influence a Bible culture, he had to use the Bible. He liked the Bible, it wasn't that, he always liked it and he always thought it had this mystical, hidden meaning, the allegorical meaning, the secret meaning. He always thought that - that the Bible was a revelation and he had it - he strongly felt that. Q. One last question, this is semi-theological. I get the impression from Charles' writings that he personally experienced Jesus Christ and considered him a living reality. I don't always find that feeling around Unity. Have you seen an evolution that way and do you feel a return? A. No, there have always been two schools in Unity - one very close to Jesus Christ and one close to the concept of Christ, the Christ within us and that has always divided the people here to some extent. It doesn't really divide them but one group has always emphasized one concept and one the other. I don't really know. Charles had any number of talks about Jesus Christ in his lifetime and if you really searched his writings you would find a number of different thoughts about Him and he finally came up with this kind of electronic Jesus Christ that was scattered throughout the universe and whom you could contact because he was everywhere - a universal something, not very clearly what, but a universal principal and you could finally contact that principal. And I think that Charles thought that the human being was evolving toward some such Jesus Christ type of individual. And more than that, Charles, himself, expected to keep his body and perfect it. Then, having done that, perhaps he would have felt that like Jesus, he could go on, I suppose, I don't know. He said different things at different times. You will find at least four different teachings about Jesus in the writings of Charles Fillmore. Don't ask me what they are because I'm not that interested. I don't think that Charles thought that Jesus was a living presence in the sense that some people do - that he is going to show up here as a human being that is going to come down on a cloud. I don't believe he ever had that concept. I think that is essentially what Unity broke loose from, that notion of the return and all that sort of thing. I don't think he had any such thought. The return was in you. No question in my mind that Charles thought that and this other thing that Jesus was going to return in robes of glory and take over the world and it was all going to come to an end and we are going to get out and dig the foundations of the New Jerusalem - I don't think that was Charles. He expected a New Jerusalem and he expected the world to be converted into a paradise, but not in that way. Unity is a within religion. You have got to work on your inside first. You have got to change all your attitudes, your thoughts, your emotions, your whole approach to life and when you do, the life will change too. Life is consciousness. I suppose if their were a basic teaching in Unity it would be that as consciousness changes, external conditions change because they are nothing but appearances and they will be whatever your consciousness creates there. Thanks Jim, that is a beautiful place to end. CLICK HERE if you wish to donate to The Church of Conscious Harmony.